Uttar Pradesh Chief Minister Akhilesh Yadav, along with Chief Justice of India T.S. Thakur, Chief Justice of Allahabad High Court D.Y. 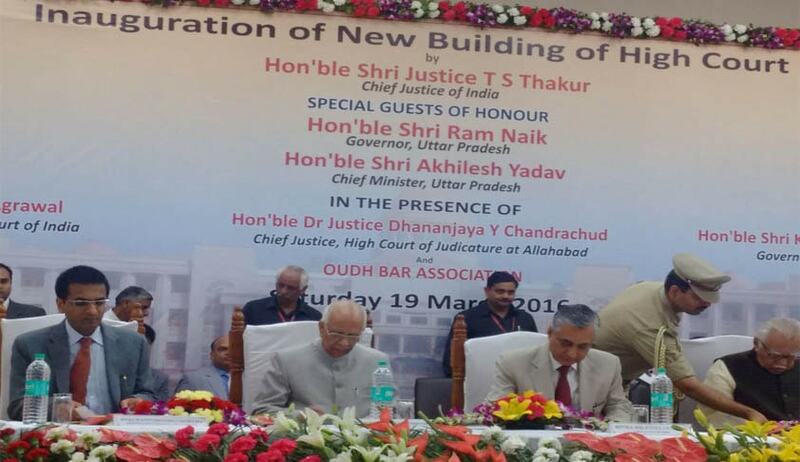 Chandrachud, and State Governor Ram Naik, inaugurated the newly constructed building of the Lucknow bench of Allahabad High Court on Saturday. Speaking at the inauguration of the red and pink sandstone building spread over 40.2 acres, Chief Justice T.S. Thakur reportedly suggested hearing and finalization of cases during summer vacations, if counsels from both sides are willing to take up the cases. He stated that in such a scenario, he would request Chief Justices of the High Courts to list the cases for hearing. He seeded the idea of doing something great this year, so that at the valedictory ceremony, the settling of cases can be a moment of pride. The CJI also marveled at the new building, saying that it is a matter of pride for the judicial system, to have received the “outstanding gift” from the Government. “A heavy sum of Rs 1,300 crore of the taxpayers money has gone into it and you cannot have any complaint that there is dearth of anything required for providing justice,” he said. In the same vein, he highlighted the lack of facilities at the Apex court, stating that the SC building got a bar room only two weeks ago with the shifting of the record room and people were still working there. CJI Thakur also recalled his association with Lucknow, for the fact that he was awarded doctor of law degree in the city and his father also studied law here. “Hence, I can proudly say that I am a product of this city,” he said. He was even quoted as saying that if the Constitution permitted, he would have gone back to practice in Lucknow. The new building, in Vibhuti Khand of Gomtinagar, has been constructed by Rajkiya Nirman Nigam. It houses 56 courtrooms with 69 chambers for judges, an office for the advocate general, 1,440 chambers for lawyers and a library on the compound. While the judges will enter the premises from gate No. 1, lawyers and other officers would enter from gate Nos. 3, 4 and 5. Visitors and litigants would be required to use gate No. 6 for entry into the campus. The compound also boasts of a three-tier underground parking facility with a capacity of 4,000 four-wheelers and 20,000 two-wheelers. It also consists of a guest house, a club house, canteen, a dispensary, a gymnasium, physiotherapy and a yoga centre besides an independent computerized railway reservation centre. The entire campus of has high frequency Wi-Fi besides there would be a 22,500 square feet conference hall which has been constructed without any pillar. The campus has an ultra modern fire station and police outpost. Last week, CJI Thakur had opined that bar was not as cooperative as it should be in the disposal of cases. He had assured that if the lawyers were ready to co-operate, Judges would be obliging to hold sittings even on Saturdays. This he expected would help in finishing back log of cases, including those of under trial prisoners who had been behind the bars for years. You may read the LiveLaw article here.